Research and Development is a puzzle-oriented single-player mod for Half-Life 2: Episode 2 developed by Matt Bortolino. It was released in July and is slowly starting to generate a well-deserved buzz in the wider gaming community. In single-player gameplay terms it’s perhaps the best thing that anyone has ever done with the Source engine, and by that I don’t mean “…by a mod developer”, I’m including the Half Life 2 episodes and Portal in that comparison. The game is set in the Half Life 2 universe and for the most part uses existing Half Life 2 assets. The player character has no hazard suit and no weapons (although they do obtain the Gravity Gun and Antlion Pheromones during the course of the game), and must progress through a series of puzzle rooms, using their wits and the environment to deal with hazards, obstacles and enemies. Many rooms introduce new game mechanics to the Half Life 2 toolbox such as portable ladders, breakable pipes, sheets of bulletproof glass and electrical traps that repulse the player instead of killing them. Some areas involve building or setting in motion physics-based Heath Robinson contraptions, others involve the kind of detective work usually found in point-and-click adventures. There are also some sequences (particularly a lengthy on-rails journey) that test the player’s ability to spot threats and counter them under time pressure. Successfully completing an area often triggers a gloriously over-the-top ‘payoff’, with the player’s actions wiping out all the nearby enemies in some amusing fashion or literally launching them into the next area. Several of the puzzles are considerably tougher to figure out and to manually execute than anything in the official Valve games, and enormously satisfying as a result. I have a growing suspicion that Valve’s obsession with iteratively tweaking their games based on feedback from testers has the unintended side effect of expunging anything challenging or frustrating, which in turn neuters their ability to be memorable or extensively replayable. Even Left4Dead often feels fairly toothless as a game (as opposed to a social experience) once the novelty has worn off, like a scrolling beat-’em-up set on free play. Research and Development’s only major shortcoming next to Valve’s own work is the understandably modest standard of its production values. There’s no new voicework, interaction with friendly NPCs or much in the way of new art, not that any of this is strictly necessary. 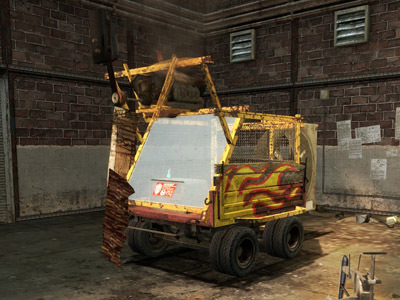 The final section of the game (which sends up the frequent use of ‘jerry-rigged’ vehicles in Half Life 2) is also a little bit glitchy in the current build, with entering and exiting the vehicle not working quite as well as it should. Although Research and Development is quite a dense experience, it’s probably only going to provide most players with an evening’s entertainment at most. Portal didn’t attract criticism for being short, but it was pretty obvious after the extended tutorial portion that they’d wrung just about all they could out of the (technically finicky and expensive) portal mechanic, whereas Research and Development gives the impression of being just be a taster of what could be delivered given enough time and money. While you’re playing it though, you’ll be too busy cooing at the steady stream of new toys, whooping with glee (well, not literally, unless you’re American) as you crack each puzzle and nodding appreciatively at the little atmospheric touches that litter every room to give much thought to these shortcomings. If you have The Orange Box for PC, get this.